Coming up now in our solo microwave section is a new cream themed model from the dependable Daewoo. Priced at just under £70 is the retro styled Daewoo KOR6N9RC cream microwave, offering a spacious 20 Litre capacity, an intuitive control system and packing 800 Watts of power from it's cream shell. It's cream - there aren't many cream microwaves available! That said, the KOR6N9RC also works well, and is reasonably priced. The KOR6N9RC's display could be a little brighter - however it is still pretty legible. 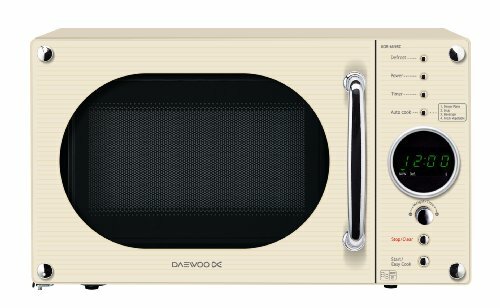 The Daewoo KOR6N9RC is one of the few cream microwaves available on the market - if you're after a microwave oven to match the rest of your cream kitchen appliances, then your choice is slightly limited. This particular model provides a fairly standard capacity of 20 litres, and offers 800w of power. Externally it measures 27.9cm by 46.5cm by 38.2cm - and so should suit even the most modest sized kitchens. As a solo microwave, the KOR6N9RC doesn't feature a built in grill or convection oven - however considering the specification we feel it is fairly reasonably priced at around £65 at the time of writing. The microwave's display is reasonably sized, but could do with being a touch brighter - in sunlight it can be a little difficult to read - a minor complaint. In normal conditions our testers found it to be perfectly legible. In terms of features, the Daewoo KOR6N9RC provides a few handy additions: Firstly the Autocook and one-touch cook menus - these include a useful auto defrost setting, which our testers found to be fairly accurate during the testing period. These settings help to take the guess work out of cooking, and help avoid over or under cooking your dishes. As with most modern microwaves, the KOR6N9RC also provides a child lock facility, which helps to avoid accidents with inquisitive little fingers. The power saving mode enables the microwave to enter an Eco mode upon ten minutes of inactivity, which uses less electricity and is more environmentally friendly, saving you money from your power bills. Overall the Daewoo KOR6N9RC looks attractive - this model is also available in a variety of different colours, such as red, purple and black, should you not like the cream colour scheme, so there's plenty of choice. The design is slightly retro - and will appeal to those with a 50's style kitchen - overall we liked the aesthetics - it's a refreshing change from the usual modern themed microwaves on the UK market. In particular the handle's design appears to be based upon the iconic fridge design of the 1950s, with it's striking chrome colour scheme contrasting with the cream of the main body of the Daewoo KOR6N9RC microwave. The KOR6N9RC's controls were easy to use and fairly well labelled - and as such this appliance will be suitable for the elderly - the small size of this cream microwave means it's probably best suited to smaller families and households. As with most Daewoo microwaves, the KOR6N9RC comes with a 1 year warranty for added peace of mind, should any issues arise. The Daewoo KOR6N9RC worked well whilst in use, and cooked evenly - we did not noticed any uncooked areas or cold spots during the testing period. It heats up fast thanks to it's 800w power output, and our testers were impressed by the overall performance and build quality. In short, the KOR6N9RC is a basic solo microwave which offers reliability and performance for an impressively low price tag. The KOR6N9RC is an easy to use cream coloured retro looking Daewoo microwave, priced at around £65. If 20 litres is a large enough capacity for your needs, then we'd recommend the Daewoo KOR6N9RC - it performed very well in our tests, and we feel it's offers excellent value. If you're after a economical yet effective solo microwave, then the KOR6N9RC comes highly recommended. We have just purchased a Daewoo KOR-6N9RC cream microwave and used it for the first time to cook jacket potatoes for 14 minutes. All worked well but the door appears to have condensation trapped inside the front glass – this does not appear to be clearing. Condensation was present on the inside of the microwave as we would have expected but easily wiped away. We are unable to reach the condensation trapped in what appears to the thin glass on the front door. Could you please let us know if this is normal and will eventually clear or if there could be a fault with our particular microwave. “There is water/moisture in the microwave oven. If you cook food with a high water content, such as jacket potatoes, it will produce moisture/condensation, which can lay in the cavity well. This needs to be dried out fully after each use.” – so I presume this is an ongoing issue which they are aware of – it might be worth contacting them to see if they can offer any advice.